What is with these people and their eagerness to flaunt their PJs in public? Just earlier, we have a Champion Breakfast Uncle who showed up at the hotel breakfast cafe in full slumber garb. At the very least, it was still indoors. This picture was taken a while back. This Champion Uncle is my winner of the year. 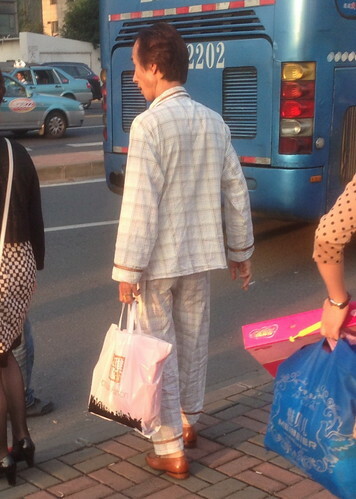 Pajamas, shopping bag to accessorize in one hand, cigarette in the other. But the ultimate has got to be the brown leather shoes. Matching color with the brown plait stripes of the pajamas some more! p.s. Then the socks where leh?